30" x 28" x 14"
Michelle on the Craft in America's NATURE episode, 2017. I started carving wood in my teens. I came to Marlboro in 1969 to attend college. I didn’t graduate, but I did stay. I met David and 40 years ago, in 1976, we opened Applewoods’ Studio on Route 9. I begin a project with locally harvested woods: maple and birch, walnut and cherry. A burl is a bulge on a tree, as benign as a wart. 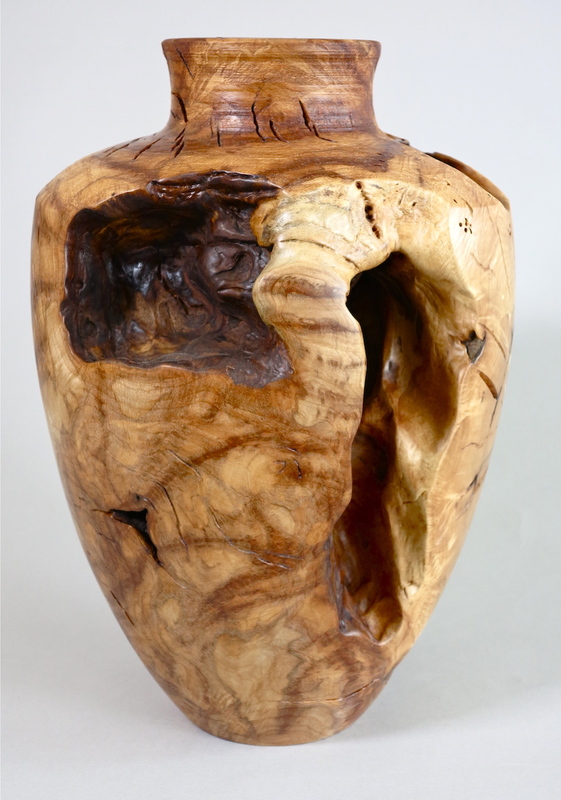 Polishing reveals the wild beauty of the burl’s irregular growth patterns. My forms are informed by these living materials. 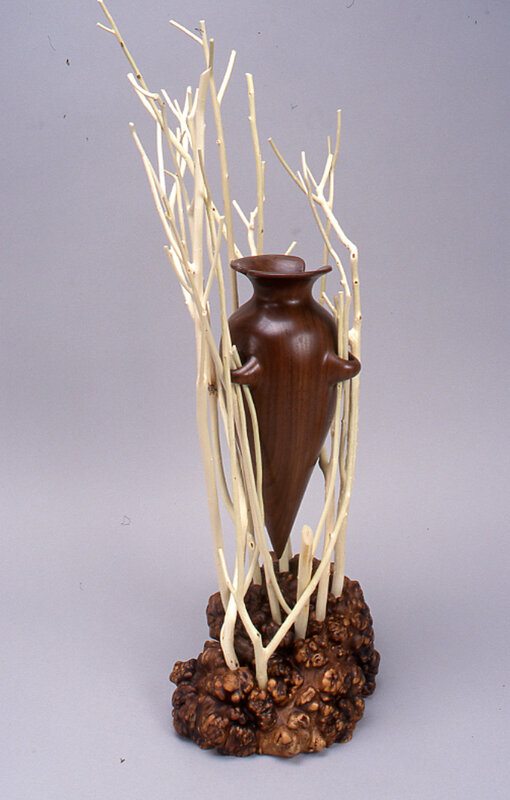 I use their irregularity as an opportunity to create a testament to the dynamic forces that shape trees. 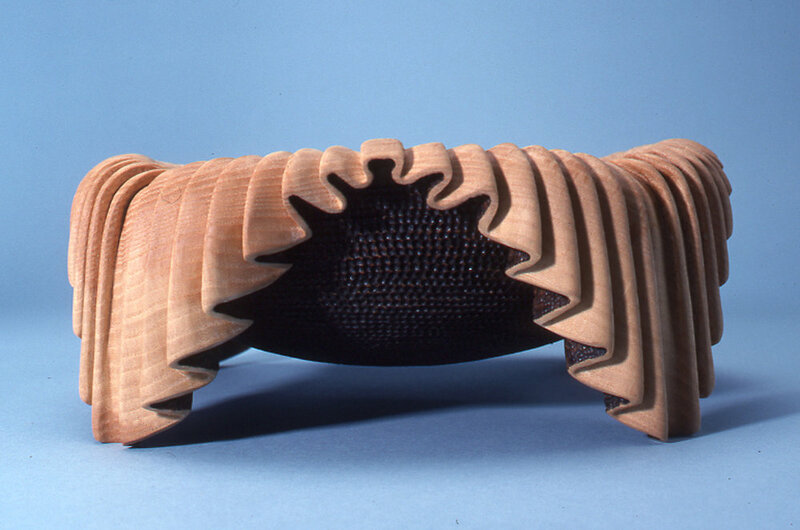 Many of my forms are generated by the lathe—the woodworker’s analog to the potter’s wheel. Mine was built by my father, a precision tool-and-die maker. It was built to shape metal, but works very well on wood. Its has saved my hands from the trauma of using traditional woodturning tools. 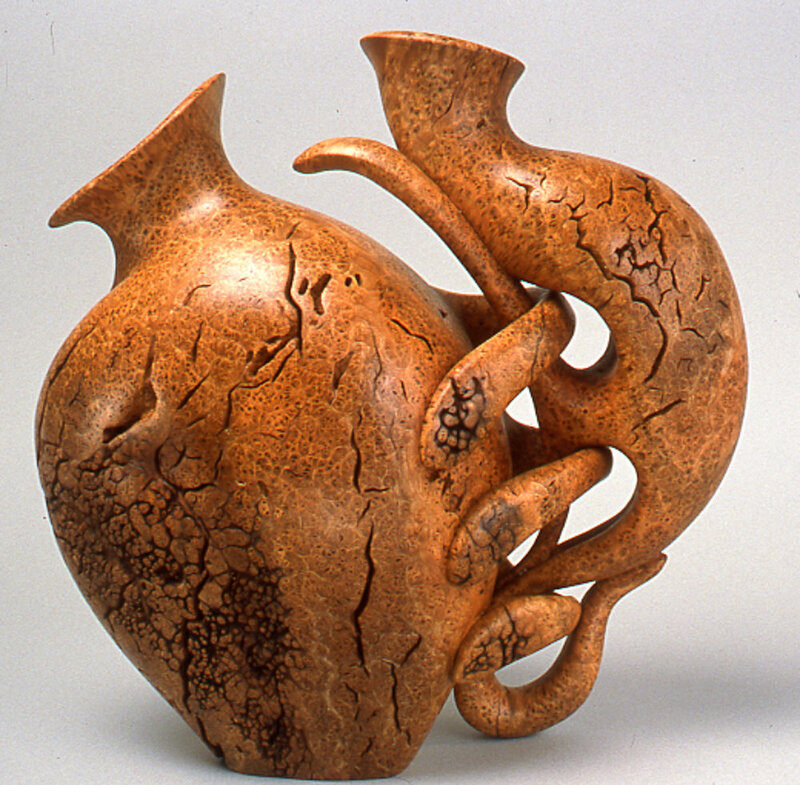 Vessels can be charming, symbolic or simply fun. The interior is less important to me than how it shares its space with you. 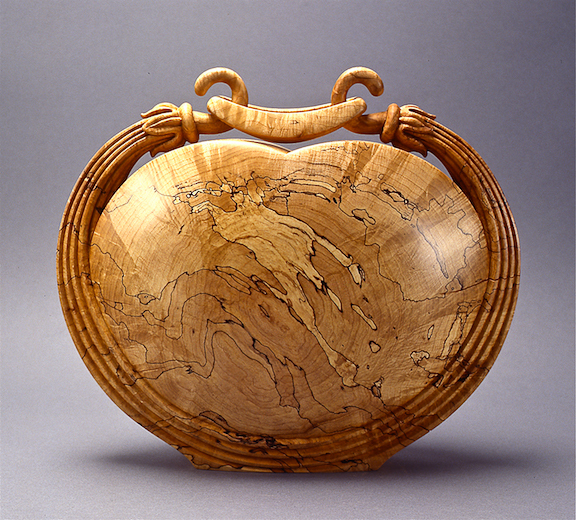 Ornamental vessels inhabit our lives, from the museum’s steps to the home’s mantle piece. The places I’ve lived have informed my work, which speaks its own vernacular. My working life has been like that of my artisan ancestors: struggle is central, but disguised. I do violence to the wood, and my joints. I seek to wrest your attention, and strive to survive in this commercial age. But when these forces are focused—and skill serves intention—a temporary peace may be won. 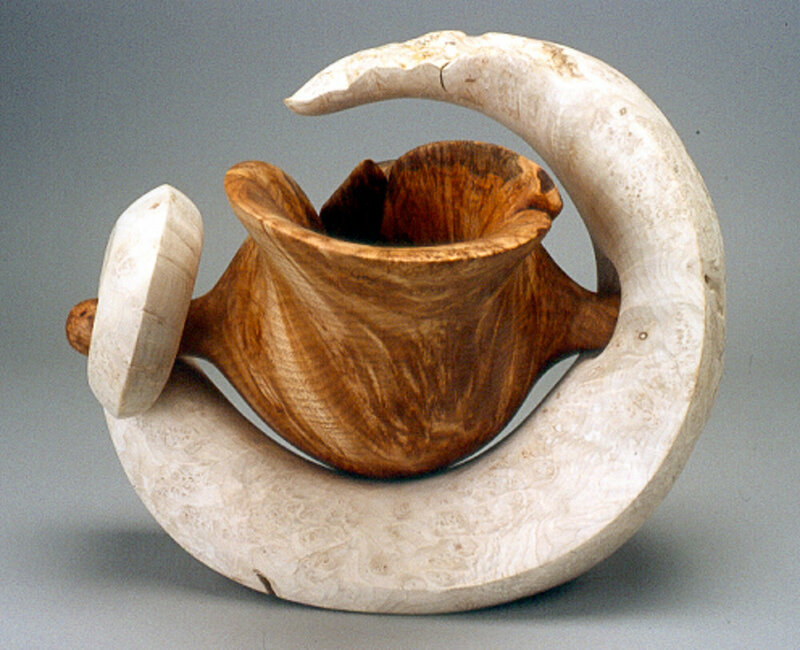 In collection of The Contemporary Museum of Hawaii. In collection of The Renwick Smithsonian Museum.